CLG for Clear with Black Text, -CB for Carboline, -CL for Clear, -EB for Electric Blue. MG TF 1.6 2002- Stainless Clear Cover With Goodridge Print Goodridge Brake Hoses SMG1350-4C-CLG. Each Goodridge ABS brake line kit is manufactured using Stainless Steel ABS blocks, Stainless Steel fittings and PTFE hose wrapped in a Stainless-Steel braid with a PVC outer to stop dirt ingress. Application: MG MGF 1.8 1995-2003. Hose Technik Performance Brake Hoses. Brake Hose Kits. Number of Lines: 4. If there are any delays we will notify you of such as soon as possible. Manufacturers Part Number: SBH-MG-4-013. MG MG TF 120 1,8 2002 2009. All Bigg Red seal & piston kits contain all the rubber components necessary to totally strip and rebuild your caliper. Buying complete with the pistons ensures you have all the necessary components to sucessfully complete the job. MG MG TF 120 2002-2009 REAR Brake Caliper Rebuild des Kit de réparation (essieu ensemble) BRKP115. MG MG TF 120 1,8 2002 2009. Complet ARRIÈRE Joint d'essieu & Kit suffit de piston (2) Les étriers pour adapter. MG MGF 1.6 2000-2002 arrière freins Caliper Rebuild Repair Kit (LH ou RH) BRKP115S. MG MGF 1,6 e 2000 2002. une complète ARRIÈRE joint & Kit suffit de piston (1) Étrier pour répondre. SpécialisteÉtrier de frein Remanufacturer. HEL Performance MG HP600 FRONT BRAKE PADS. MG ZT 260 2003 - 2005. This process removes unwanted gasses from the materials in advance, reducing the gasses that can cause fade within the brake pad. MG X-Power 4.6SV 2003 - 2008. DP41339R EBC YellowStuff Front Brake Pads MG ZR. EBC Part Code: DP41339R. EBC YellowStuff Front Brake Pads. This is not a low dust pad. MG ZR 1.8 [160bhp]. Each Goodridge ABS brake line kit is manufactured using Stainless Steel ABS blocks, Stainless Steel fittings and PTFE hose wrapped in a Stainless-Steel braid with a PVC outer to stop dirt ingress. MG ZR 1.4 105 Rear Drums/Non-ABS 2001-2005 Zinc Plated Electric Blue Goodridge Brake Hoses SMG1601-4P-EB. PD01KR037 EBC Rear Brake Kit (Standard Discs & GreenStuff Pads) MG TF. MG TF 1.8 [160bhp]. EBC Rear Brake Kit (Standard Discs & GreenStuff Pads). EBC Part Code: PD01KR037. Contents: Full Rear Axle Brake Kit [Discs & Pads]. However delays are occasionally inevitable due to unforeseen circumstances. A to Z Motor Spares (Wakefield). PD01KF158 EBC Front Brake Kit (Standard Discs & GreenStuff Pads) MG Midget. MG Midget 1.5 (Wire Wheels). EBC Front Brake Kit (Standard Discs & GreenStuff Pads). EBC Part Code: PD01KF158. Contents: Full Front Axle Brake Kit [Discs & Pads]. FRONT BRAKE LINES MG TF 1.8 VVC (2002-2005). Each HEL Performance brake line kit is assembled in-house from the finest quality stainless steel fittings swaged directly to hard drawn tensile stainless steel braided hose. MG Zs (Arriere. Disque) 01-05 Goodridge Inox El Bleu Durites de Frein. MG ZS (Disc Rr.). Model ZS (Rr. Tous les kits de flexible de frein Phantom Goodridge sont fournis avec des conduites en acier inoxydable, ce kit est fourni avec les embouts en acier inoxydable et tuyau de couleur bleu électrique couvrant. ). HEL Performance MGA STAINLESS STEEL BRAIDED BRAKE PIPE SET. Each HEL Performance brake line kit is assembled in-house from the finest quality stainless steel fittings swaged directly to hard drawn tensile stainless steel braided hose. MG Midget Mk II-V 64-80 Goodridge zingué chaux flexibles de frein vert SMG0500-3P-LG. Model Midget Mk II-V. Feature - Goodridge employ over 300 staff worldwide with nine Goodridge locations and over 250 handpicked distributors. CODICE : FRP3085R - DS3000. CODE : FRP3085R - DS3000. CODIGO : FRP3085R - DS3000. 116A-FRP3085R PLAQUETTES DE FREIN FERODO RACING DS3000 MG MG TF 1.8 (160). 116A-FRP3085R PASTILLAS DE FRENO FERODO RACING DS3000 MG MG TF 1.8 (160). CLG for Clear with Black Text, -CB for Carboline, -CL for Clear, -EB for Electric Blue. MG MGA 1.6 1959-1960 Stainless Clear Cover With Goodridge Print Goodridge Brake Hoses SMG1001-3C-CLG. 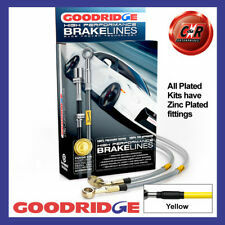 Each Goodridge ABS brake line kit is manufactured using Stainless Steel ABS blocks, Stainless Steel fittings and PTFE hose wrapped in a Stainless-Steel braid with a PVC outer to stop dirt ingress. DP2107 EBC GreenStuff Front Brake Pads MG B. EBC Part Code: DP2107. EBC GreenStuff Front Brake Pads. There is no such thing as a no dust pad and all brake pads create more dust as they are bedding-in especially if brake discs are worn. Model Midget Mk II-V. Tous les kits de flexible de frein Phantom Goodridge sont fournis avec des conduites en acier inoxydable, ce kit est fourni avec les embouts en acier inoxydable et tuyau transparent couvrant.